Stevens students and volunteers celebrate the success of StevensTHON 2018 in Stevens' Bissinger Hall, the site of the 12-hour dance marathon. When the 12-hour dance marathon came to an end at 7 a.m., Saturday, April 29, on the Stevens Institute of Technology campus, the school’s undergraduate students had raised a total of $45,828.03 for the children and families at Children's Specialized Hospital (CSH) in Mountainside, New Jersey. “Meeting and surpassing the $45,000 goal is phenomenal given the size of our school and how fairly new the event is for us,” said Christopher Shemanski, associate director in the Office of Undergraduate Student Life. The dance marathon is the culmination of StevensTHON, a year-long philanthropic movement that requires nearly two full semesters of intense planning and outreach by students. StevensTHON is one of five collegiate marathons to support CSH, which is part of the larger, nationally recognized Children’s Miracle Network (CMN) Hospitals. Since its inaugural event in 2016, the student-led effort has raised more than $96,000 for children battling traumatic brain injuries, spinal cord injuries, autism, premature birth and many other life-changing and life-threatening illnesses. The year-over-year increase in fundraising has been impressive: nearly $21,000 in 2016, more than $30,000 in 2017, and this year, more than $45,000. The tremendous success of StevensTHON makes Stevens the second highest fundraising school for CSH, according to Kayla Pagnani, a CMN Hospitals program manager at CSH. (l-r) Nicole Maetta, StevensTHON executive director, John Dalton '60 and Kayla Pagnani, program manager for the Children’s Miracle Network Hospitals, at the dance marathon held at Stevens Institute of Technology April 28-29, 2018. 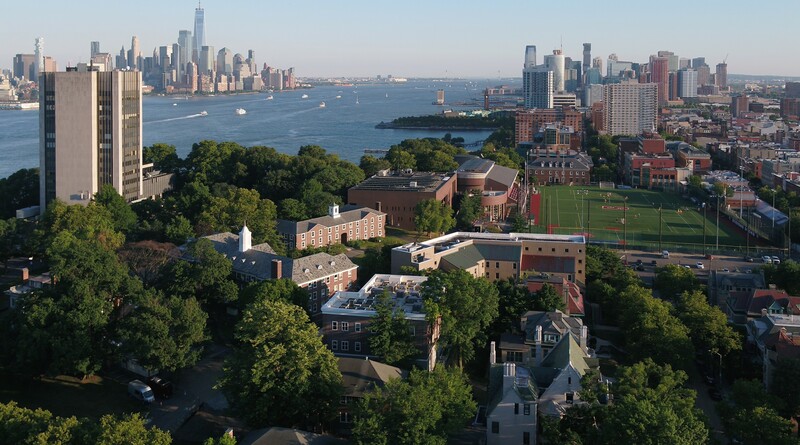 “Stevens students work tirelessly year-round to make sure their goals are met, utilizing peer-to-peer fundraising, building relationships with businesses across Hoboken, and hosting all-inclusive events on their campus. The passion and determination behind this program is truly incredible, and we are so lucky to have them as members of our CSH family,” said Pagnani. Many of the StevensTHON students are seniors who are juggling classes, senior design, extracurricular activities, and preparing for graduation. “They find the time because they’re passionate about the financial assistance that goes toward the children. It keeps them up and gives them the energy to get through the dance marathon, which occurs right before final exams,” notes Shemenaski. Stevens senior Nicole Maetta served as executive director of StevensTHON 2018 and has spent roughly 10 hours a week planning for the event. For Maetta and other students serving on the executive board of StevensTHON, the reward for all their hard work comes from meeting with and hearing from the children and families directly benefiting from the work of CMN Hospitals, which provides support to more than 11,000,000 children and families across the world, regardless of their financial status. “It’s really important to see firsthand the kinds of treatment provided at these hospitals, what they do and how much support they need,” Maetta said. Jennifer Muschello, also a senior, served as dance marathon chair, in charge of venue selection, fostering relationships with other student organizations, and creating and planning activities for every hour of the dance marathon, including selection of music, dance themes, and games that ranged from hula hoop contests and karaoke to raffles and relay races. The most important part of her role, she says, is reminding and connecting participants to the mission of StevensTHON. “Reaching our goal every year is a fun challenge, but it’s important to take a step back and look at the impact that we are making for kids in New Jersey. Forty-five thousand dollars can go a long way to help children receive the medical treatments they need, undergo lifesaving surgeries, experience rehabilitation therapies, and reach their full potential,” said Muschello. Maetta, a mechanical engineering major, will soon begin her career as a project manager at EPIC, a healthcare electronic records company in Madison, Wisconsin. She is handing off her executive director duties to Gianna Marcovecchio, who will be a fourth year mechanical engineering student this fall. Marcovecchio served as a recruitment chair last year and as external director this year. “I’ve gained a lot of insight into StevensTHON from being on the executive team for the past two years. So I bring a lot of experience to the executive director role. StevensTHON is an incredible organization so I’m glad to play a part in its growth,” said Marcovecchio. Raising $45,000 was a goal the team had set last year when the fall semester began, and Shemanski is not at all surprised at what they have accomplished. “Our students are so goal-driven that when they set their minds to achieve something they’re determined to make it happen,” he said.